Hair: Blond, slightly curly and fairly short. Life history: Suntop is Cutter and Leetah's shy and gentle son, quite different from his sister Ember, who has the full Wolfrider personality where Suntop is closer to the Sun Folk in his manners. Suntop is also different from his sister in that he is immortal; while the twins were in Leetah's womb, Ember was given the Wolfrider heritage, including all the wolf-blood, where Suntop was given exceptionally strong magical abilities. Suntop has the power of astral projection, has what he calls a 'magic feeling', a sense which enables him to tell whether something (like a rock or tree) has been magically influenced, as well as having an immense sending range, both in receiving and sending himself. These magical abilities were often a cause of jealousy for Ember, who felt like only magic-users were useful and that she was being left out of everything. In recent years Ember has had her full share of attention however, becoming a full-fledged chieftess herself while Suntop receded more to the background. It was already at a very young age that it was established that Ember would be the next Wolfrider chief, with Suntop saying "I'll be what I'll be". He received some training from Savah, and it was Suntop who communicated with her on the astral plane when she was being held spiritually by Winnowill. He received Savah's warning there, setting the Wolfriders off on a trip to bring him to Cutter to give him that warning. He was very anxious to get to Cutter on time, wearing himself out and worrying, and probably felt that he had in some way failed, firstly by not being able to prevent Strongbow from shooting the fledgling hawk (so the Wolfriders got captured) and secondly by not being able to prevent Cutter and the others to go into Blue Mountain. In the end it was him and Ember who managed to free the Wolfriders however, by basically showing themselves to Lord Voll, who didn't believe elf children existed anymore. When Lord Voll was becoming too charmed with the Wolfriders for Winnowill's liking, she abducted Suntop and took him to her private quarters. Suntop learned from her that she was holding Savah's spirit and 'went out' to try and contact her, thereby letting his own spirit be captured too. It didn't last long, though, he was released again when Strongbow wounded Winnowill, and so he could pass the message to Leetah that Winnowill needed healing, although when Leetah tried to, Winnowill stepped off a height in order not to be. After the elf-troll war for the Palace, it was Suntop who first discovered that there was something strange with the wolf that had gone into the Palace with the elves. It turned out to be Timmain, the mother of all Wolfriders, who led the elves to the Scroll of Colours where she used Suntop to speak through while she was turning the Scroll. The next three years Suntop spent with the Wolfriders in the holt in the Forbidden Grove, during which he couldn't use his powers for fear of being mentally captured by Winnowill. This was one of the reasons why it was decided that Winnowill's powers should be broken. During the whole campaign that followed Suntop disobeyed his father's orders that he shouldn't 'go out' (after some prodding from Ember) and did so anyway to contact Savah, and only escaped again because Winnowill was being distracted by Kureel, who was bleeding to death after being wounded by Aroree at the time. In the end it were Suntop, Leetah and Rayek who subdued Winnowill so Leetah could begin her healing. After Winnowill's defeat, Suntop suddenly started hearing a powerful cry for help from unknown elves far away. Trying to seek help with this from Timmain, Suntop found her unreachable (she had changed back to a wolf after Rayek's enraged attack on the Go-Backs) and contacted Rayek instead. Rayek had by then found the power to fly the Palace and flew it to the Wolfriders' holt, then taking the entire tribe to Sorrow's End, where a party was assembled to seek out the cry's origin. The Palace was flown across the Vastdeep Water, where the elves eventually dicovered that the cry was an echo of the cry for help that the High Ones had emitted when they crash-landed on the World of Two Moons. Rayek then also discovered that he could fly the Palace through time and took it into the future in spite of Cutter's (and basically everybody else's) protests, taking Leetah, Skywise, Suntop and Ember with him because they were in the Palace at the time. This is basically where Suntop starts more or less fading into the background somewhat. After the Palace's return he spent the six years in which Rayek was trying to get his powers back training with Savah on the astral plane, and after that he was brought to Sorrow's End by Rayek to receive proper, face to face training from Savah. He left with Dart's band to the Forevergreen to rescue Windkin and after his adventures there returned to the reassembled Palace. 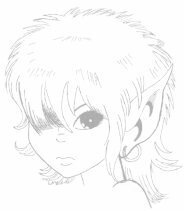 Suntop seems slated to either Recognize or become lovemate to the Wavedancer elf Brill, judging from the 1999 Elfquest calendar.